GambiaRising is a small, committed team of Gambians and Americans working to make it possible for deserving Gambian students to stay in school. Every dollar of new donations for scholarships goes directly to support the students; a Board member pays all overhead, and none of our team receive any pay for their work on behalf of those we serve. Currently, we support students in more than 80 different Gambian schools from nursery school through Gambia College and the University of The Gambia. Mike began an informal scholarship program while serving as Country Director for Peace Corps in The Gambia from 2007 through 2009. In 2010, the program was formally organized and registered as GambiaRising with him as Managing Trustee. Prior to serving in The Gambia, he was an educator, CEO of several technology companies in Silicon Valley, and co-founder of Niman Ranch, a leading brand of family-farmed, humanely-raised meat. He has served on several Boards of young technology companies and was on the National Council of the World Wildlife Fund for six years. In 1967, while with the Fulbright program in India, he helped start the Samanvay School in Bodh-Gaya, and remains a supporter of that institution. Kebba Sanyang is UpCountry Program Coordinator for GambiaRising. Kebba is also the Principal of St. Therese's Basic Cycle and Senior Secondary Schools in Fula Bantang, Central River Region, where GambiaRising has been most active in supporting students as well as the school. One of the most dynamic educators in the country, he is passionate about education, committed to the students, and is one of the best school administrators in The Gambia. Despite other opportunities being available to him, he has stayed in remote Fula Bantang to be part of creating a center of excellence there. ​Isatou is a teacher at St. Matthew’s Lower Basic Cycle School in Kaimo. She also lives with her son at the school. Isatou is responsible for students in the catchment area of St. Matthew’s School as well as Sibanor. She has also helped a teacher from St. Matthew's go back to Gambia College to get their degree, with support from GambiaRising. Matthew Gomez, working with Dawda Faye, coordinates GambiaRising's work on the north bank of the River Gambia. Matthew is the Vice Principal of St. Michael's Basic Cycle School in Njongon, half-way between the north bank ferry port of Barra and the border of Senegal. Prior to serving at St. Michael's, he was Principal of St. Therese's Basic Cycle School in Fula Bantang, after which he took a leave of absence to attend the University of The Gambia and study management in school administration. Rafael is a key member of the School Management Committee in Fula Bantang; his grandfather was the founder of St. Therese's school there. He is also a retired agriculturalist and taken a number of students into his home so they could attend St. Therese's. When you see tree planting anywhere in the Fula Bantang area, it is likely that Rafael's nursery was involved. His vision is driving the agricultural program at the new senior secondary school being built with our support in Fula Bantang. Originally from Fula Bantang, Mariama now teaches at Lamin Daranka Lower Basic Cycle School. With assistance from her husband Ebrima (a former Peace Corps intern who now works at the U.S. Embassy), she has helped more than a dozen students from her home of Lamin Daranka to apply for support to enroll in (or go back to) school, and is our liaison with them. She has also helped several teachers from Lamin Daranka go back to Gambia College to get their degree, with support from GambiaRising. Yaya was GambiaRising's first in-country co-ordinator, after Mike and Father Jean moved to the U.S. and Senegal respectively, and before Father Moses took the reins. While doing so, Yaya worked at Peace Corps in the Finance and Training departments. Yaya now resides in Massachusetts and works at a benefits administration company. But when he is not working there, he is a Communications Coordinator, updating student records, and organizing their videos and photos to keep sponsors informed. 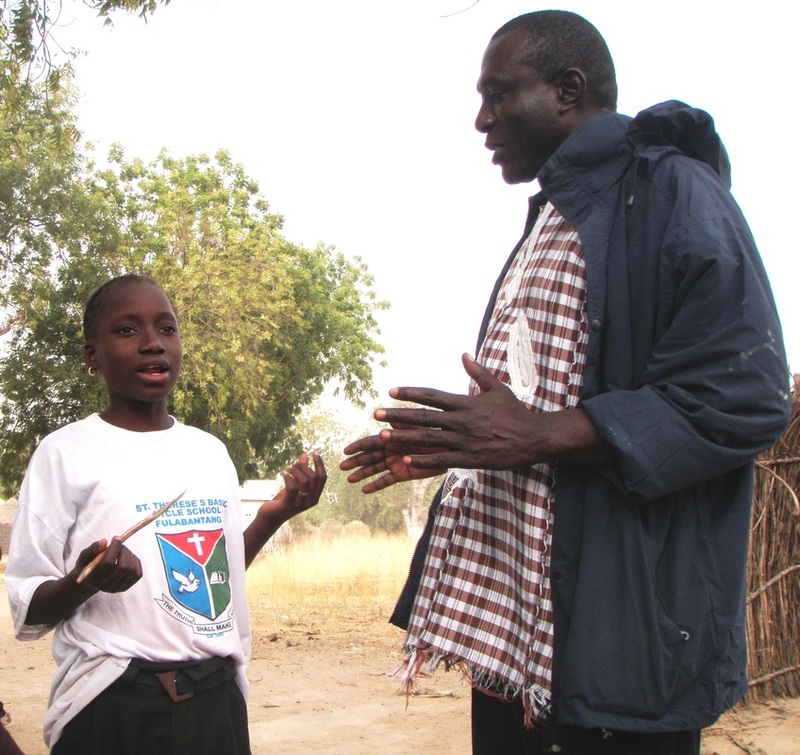 Bjorn is a member of Gambia Rising's Board of Trustees. He was an agriculture and natural resource management volunteer with Peace Corps in the Gambia from 2007 to 2009 and spent most of his time there growing demonstration orchards. He also led a current events and democracy club in a local senior secondary school. ​Currently Bjorn is based in The Bekaa Valley, Lebanon, where he works as Area Manager for the Danish Refugee Council. Brian is a member of GambiaRising's Board of Trustees. He served in the agricultural sector of Peace Corps The Gambia from 2007 to 2009, working in the rural upcountry promoting the use of various agroforestry techniques, while also spending time working with a women's skills training center. Currently, he is a Client Representative with IBM focused on bringing technology-based solutions to healthcare organizations in New England. ​ American Embassy School in The Gambia. Marnie is a member of Gambia Rising's Board of Trustees. Marnie was a Health and Community Development Volunteer with the Peace Corps in the Gambia from 2008 to 2010. While there, Marnie focused on grassroots, reproductive health education and worked with a local women's group to build a garden. Currently Marnie works at Google as Diversity Manager. Cat is a member of GambiaRising's Board of Trustees. She served as a Primary Teacher Trainer at Jallow Kunda Lower Basic School in the Central River Region of The Gambia from 2011-2014. Cat worked with the teachers on improving literacy, interactive teaching methods and school leadership. In the community she worked to design income generating projects as well as a women's football organization. Cat arrived back in the US in February 2014 but returned to The Gambia in for six more months as a Peace Corps Response volunteer, working with the Ministry of Education and Peace Corps on monitoring and evaluation. She now works in a youth program in Houston. Beth is a member of GambiaRising's Board of Trustees. From 2007 - 2009 she was a Health & Community Development Peace Corps volunteer in Jakaba, Central River Region. Beth is currently Communications and Outreach Manager for the Basic Education Coalition in Washington, DC. Joanna is a member of GambiaRising's Board of Trustees. She did her Corps service in The Gambia where she was a Math Teacher Trainer at Armitage Senior Secondary School on the island of Janjanbureh. During her service she worked closely with the GambiaRising students who attend Armitage, as well as with Kebba Sanyang to help facilitate the program. Now back in the US, she now works for the U.S. State Department. Since 2008, when she completed her Peace Corps service as an agriculture and forestry volunteer in The Gambia (2005-2007) and in Senegal (2008), Sarah has been running a scholarship fund to support 10-15 students/year from her former Gambian host-village. In 2016 Sarah joined the GambiaRising board and the KAM Scholarship Fund gained GambiaRising's fiscal sponsorship. Sarah's most significant accomplishment during her Peace Corps service was leading a team of Gambian government staff and American volunteers to expand a school tree-growing competition to all regions of The Gambia for the first time. Her work experience includes water policy research in the Middle East, drip irrigation product testing and sales in India for a Silicon Valley start-up, and water program management in sub-Saharan Africa for a Washington DC-based NGO. She holds a BA in sociology from Cornell University and an MS in water resource management from McGill University's bioresource engineering department. Josh is a member of GambiaRising’s Board of Trustees. He was a career diplomat in the U.S. Foreign Service serving in Mexico and in The Gambia. While in The Gambia, he directed the Embassy's Public Affairs Office. In this role he was the Embassy's spokesman and oversaw the Embassy's outreach efforts, education programs, media initiatives, and launched and hosted the world's first weekly Embassy-hosted national radio program with 200,000 weekly listeners. ​​He was the recipient of the State Department's Superior Honor Award. Prior, Josh spent five years at the U.S. Department of the Treasury where his roles included serving as the Deputy Treasury Attaché to Saudi Arabia and as the Treasury Director of the Iraq Threat Finance Cell. Currently, Josh is based in New York City where he is a Senior Manager at the data analytics firm Quid, Inc.
Mark is a member of GambiaRising's Board of Trustees. He served as an agriculture and micro-enterprise development volunteer with Peace Corps in The Gambia from 2007 to 2009 and spent most of his time working to build the management capacity of a local women's village-level savings and loan program and helping small-holder farmers increase their access to local markets. Currently, Mark is working as the Manager of Business Development at Making Cents International in Washington, D.C. Since returning to The U.S in late 2016, Paige Walters proudly joined the GambiaRising's Board of Trustees, after serving as a Gambia Peace Corps Volunteer from 2014-16 in the Upper River Region of the country. In her tenure as a PCV, Paige’s biggest accomplishment was developing and seeing through a country long “marathon,” with the guidance and support of GambiaRising. She was trained to serve as a Health Education Volunteer, and during Paige’s time in country she worked closely with women and children and educated her Sarahule village on preventative health measures. ​Stephen is a member of GambiaRising’s Board of Trustees. He served as an Education sector Peace Corps Volunteer in The Gambia from 2015 to 2017, in the village of Seno Bajonki, near Soma Town. Stephen is a graduate of SIT Graduate Institute, where he earned his master’s degree in sustainable development, and is Monitoring and Evaluation Coordinator for the International Foundation For Electoral Systems. Father Jarju is the Catholic Education Secretary in The Gambia, managing all the public schools under the Secretariat's jurisdiction in the country. Due to the excellence of administration in this network of schools, GambiaRising has worked with several of them closely. These are former "mission schools" but are now fully part of the Gambian public school system, with a non-denominational curriculum identical to other public schools. But they are administered under contract from the Gambian Education Ministry. We could not do this without the friendship and support of Father Jarju. Before becoming Secretary, Father Jarju was Principal of St. Peter's Senior Secondary School in Lamin, where we also worked with him. Dr. Kujabi is the former Catholic Education Secretary, and "Godfather" of the new senior secondary school in Fula Bantang. Dawda Faye is Education Officer for the Secretariat and a key administrator at the Secretariat. He worked with Matthew Gomez to extend the program to the North Bank Region, visiting families there, assessing cases, and recommending students for the program. And when it comes to questions of school construction and improvement, Dawda is alreadys ready to help, designing buildings, creating budgets and plans, and making sure that things go smoothly. No school can succeed without the support of the community it serves. Principal Kebba Sanyang has worked closely with the Alkalo and other community leaders to ensure and expand that support. Father Jean Diagne is a dedicated priest in the order of Spiritans. Father Jean was parish priest in Bansang from 2006 to 2010, where a Peace Corps volunteer introduced him to us. As parish priest, Father Jean was manager of all mission schools in the Central River Region, but worked tirelessly at St. Therese's. Although he was transferred elsewhere in west Africa in 2011, he continued to coordinate most of the scholarship activities for GambiaRising until handing over the reins to Father Moses in June, 2013. (Please note: there is no formal relationship between the Spiritans or the Catholic Church and GambiaRising, and Father Jean worked and Father Moses works on the program on their own time, supporting students without regard to religion or tribal background.) We are grateful to Father Jean for his role in getting GambiaRising off the ground and helping set its direction. Father Moses was the dedicated National Coordinator for GambiaRising after Father Jean's departure and into 2018, handling funds distribution, student selection, prioritizing appeals, and liaison with supported students in the Kombo districts around the capital. Father Moses was stationed in Lamin, near the capital, and is the Rector of the seminary at St. Peter's. Bill was a founding member of GambiaRising's Board of Trustees and is now a Trustee Emeritus. After retiring from a career as an Engineer at Lockheed Martin, Bill joined Peace Corps where he served as an Education (IT) Peace Corps volunteer in The Gambia from 2007-9, teaching at the Gambia Technical and Training Institute (GTTI), and as a Peace Corps volunteer from 2010-11 in Uganda. He currently lives in San Diego and does volunteer work for several organizations, including Teaching English to Speakers of Other Languages. Rebecca was a member of GambiaRising's Board of Trustees from 2011-16. She served as an Education and Gender & Development Peace Corps volunteer in The Gambia from 2006 to 2008, stationed at St. Michael's Basic Cycle School in Njongon. Currently, she manages education and capacity-development programs as Senior Education Officer at World Learning and lives in Washington, DC. Jon Vallee loved The Gambia and its people. In his retirement, he travelled there often and worked with his friends to directly benefit upcountry Gambians. In recent years, his focus has been on his partnership with GambiaRising and our UpCountry Coordinator Kebba Sanyang first to improve St. Therese's Basic Cycle School in Fula Bantang, then, when he found out he had only a few years to live, to inspire and organize the building of a senior secondary school in Fula Bantang. Jon left us in early 2017, but his work will continue to benefit young Gambians for generations to come. He was a great friend and partner.